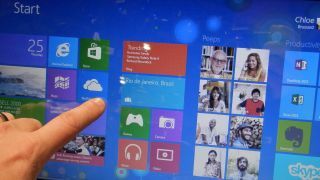 Windows 8 becoming a scapegoat? Fujitsu president Masami Yamamoto has said the lack of appetite for Microsoft's Windows 8 operating system is hurting PC sales. Speaking to reporters in Japan on Thursday, Yamamoto said the demand had been "weak," following the launch of the re-imagined operating system in late October. PC shipments are expected to fall short of the company's 7m estimates when everything is tallied up at the end of the fiscal year in March. Yamamoto's comments come in the same week that Acer president Jim Wong said that customer adoption may be "dramatically delayed" as users become accustomed to the radical new interface. Leading manufacturers citing Windows 8 as the answer to shortcomings in their bottom lines might become a bit of a theme in the next few months, as the PC industry continues to struggle. Microsoft has plenty riding on the success of Windows 8, but if it fails it could also bring down an entire segment of the market.